The concept of meal frequency has been on an interesting roller coaster of the past couple of decades. For the longest time it was ingrained into our minds that we should "Eat 3 Square Meals a Day to Be Healthy." Then people started becoming more and more overweight and unhealthy and this idea of 3 meals per day turned into 5-6 smaller meals per day for optimal health or those trying to lose weight. And now I see the pendulum starting to swing back the other direction, even further than where it started with the increase in popularity of reduced meal frequencies and various time-restricted feeding patterns. So what's the best strategy? Is there really a benefit from eating 5-6 smaller meals per day? Let's first define some of these terms before we go any further. Meal frequency, as the name implies, is simply how frequently you are eating meals or snacks throughout the day. For example, are you someone who eats 3 times per day (breakfast, lunch and dinner) or 5-6 times per day (3 smaller meals and 2 snacks for example)? Next we have time-restricted feeding which is also referred to as fasting or intermittent fasting. 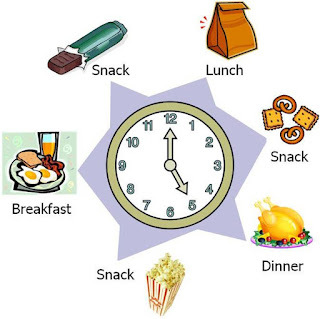 Which these eating strategies, you are essentially limiting the periods of time throughout the day during which you eat anything; meal or snack. Or, some fasting protocols actually have you go an entire day without eating or a 24 hr. fast. The most common fasting protocol nowadays is probably a 16 hr. fast followed by an 8 hr. feeding window. So for example, someone following this fasting protocol would only eat between noon and 8:00 PM while fasting the rest of the day. For the purposes of this article we are going to be primarily looking at the original dietary strategy, meal frequency patterns. Also, advocates of the 5-6 meals per day often tout that it helps curb appetite and reduce hunger cravings throughout the day because you are allowed to eat more frequently however some research actually shows just the opposite and the fact that people are limited to smaller portions and snacks throughout the day they aren't as satisfied and left slightly hungry. In my opinion it essentially comes down to preference and whichever feeding pattern best allows you to hit your calorie and macronutrient requirements throughout the day. If 1-2 large meals works better for your schedule and prevents you from overeating, than 1-2 meals is the way to go. Conversely, if you are someone who does better with smaller more frequent meals to help better regulate hunger, cravings and hit your calorie needs than by all means opt for the 5-6 meal frequency pattern.